[A]fter an unsustainable boom period, the economy needs to "recalculate" and figure out where the excess workers (from the bloated sectors) need to go so that the economy can resume a stable, sustainable growth... Kling (and the Austrians) are arguing that this recession is not simply about a lack of generic "spending" but rather is tied to the preceding housing boom. In particular, during the boom, workers were sucked into construction (and other related occupations). Once the housing bubble collapsed, these excess workers needed to go someplace else. That's why unemployment started rising, and "the recession" set in. Scott Sumner responded to this claim by nothing that though this understanding seems reasonable--it was the greatest housing boom after all--it is not supported by the data. The housing boom peaked in early 2006 and yet the Great Recession does not really start to get going until mid-to-late 2008, when policymakers allow aggregate spending to collapse. Thus, the housing bust at best would have led to a mild recession. 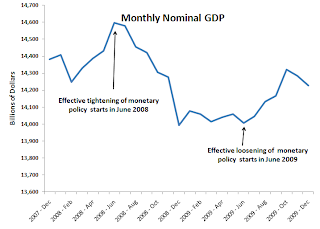 It was the failure of monetary policy that created the Great Recession. Murphy replied to Sumner by asking him to consider construction employment. He argued that by plotting construction data along with the unemployment rate one can actually see a recalculation story in the data. His figure, though, was not very convincing as it revealed that the unemployment rate does not start its pronounced climb until about May 2008 whereas construction employment begins its nose dive back in May 2007. 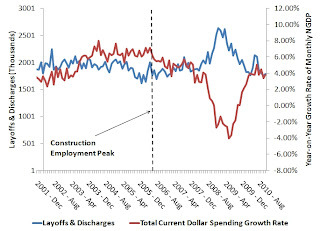 Thus, unemployment was relatively stable about a year after construction employment began plummeting. This is more consistent with Sumner's story. This figure shows that through April, 2008 non-construction employment in rising (and it only significantly starts declining in June, 2008). 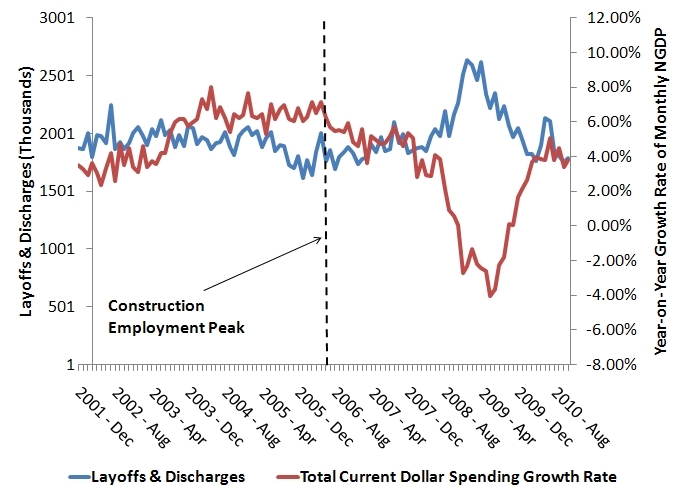 This, despite the fact that construction employment had been rapidly dropping from May, 2007 and had stalled out back in April, 2006. In other words, the rest of the economy was doing a decent job absorbing the displaced construction workers for over a year. No reallocation story here. Chalk one up for Scott Sumner. As I see it, this recession is _not_ high layoffs causing a decrease in employment, but rather a slight increase in layoffs during teh worst part of the recession combined several years of unusually low hires. As you have shown, the jump in layoffs did occur when nominal GDP dropped. However, the consistently low new hires looks consistent with an economy where the volume of sales are not growing hardly anywhere. Normally, some firms layoff workers, of course. But there are lots of areas of the economy where sales are growing and firms are hiring new workers to expand production enough to maintain sales. Some sectors of the economy shrank, as usual, with layoffs mostly as normal. But there were no areas in the economy with growing expenditures. Excellent clarity and superb post. "The data seems very clear to me. It indicates there was a housing bust that was putting a damper on economic activity, but by itself was not large enough to create the Great Recession of 2007-2009. 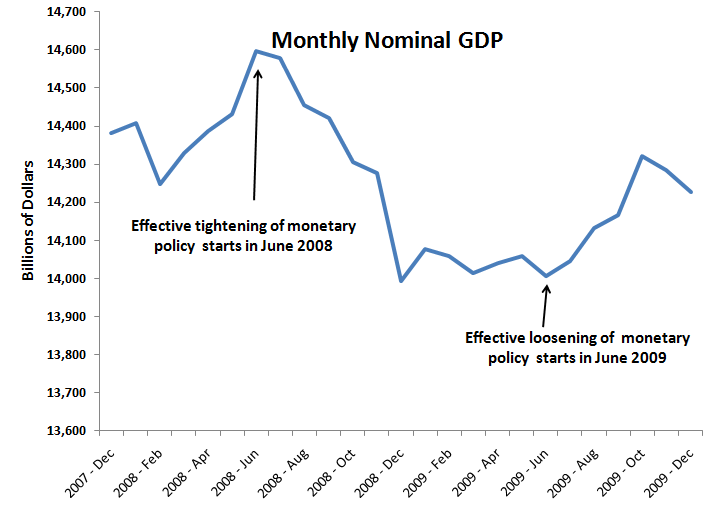 Rather, that required the failure of Fed officials to stabilize nominal spending in 2008. " The picture as I understood, was that the housing bubble collapsed and caused a minor recession, but then the stresses built up in the financial sector as the MBS stuff turned toxic and so forth, causing the collapse of the shadow banking sector, which is what really led to the cliff-diving in late 2008. Housing bubble---collapse---recession---financial sector implosion----cliff diving. That was my previous understanding. That picture is not accurate? Austrian ideology demands that they view the unemployment situation as structural. Facts and data are not going to sway anybody's belief system. From what I've seen of Murphy, he's a sloppy thinker, as well. For his claim to make any sense, construction workers have to have non-transferable skills. As if general mechanical aptitude and the ability to handle tools is some esoteric specialty the makes other employment opportunities hard to grasp. Via Krugman, Mike Konczal blasted a big hole in the structural argument last Sept. The only way the structural argument could be saved would be if there were large numbers of unfilled openings in certain occupations because people with the needed skills can't be located. Is anything like that actually happening? This WSJ report shows increases from 2007 through 2009/10- many quite dramatic - in almost every occupation - as varied as maids and CEO's - for which they have data. More to the point, I think, is the inability of people trapped in underwater mortgages to move to places where the job opportunities might be. On the structural point here are some more studies which indicate that skilled labour shortages are a minor problem for employers compared to other factors. 1. http://www.nfib.com/Portals/0/PDF/sbet/sbet201009.pdf (See in particular page 18). 2. http://www.blumshapiro.com/pub/articles/BlumShapiroCBIASurvey.pdf (Page 4 in particular). I keep arguing that it was energy prices that tipped a shaky economy in mid-2008 into a bad recession in late 2008. Yes, the housing sector was in decline and in retrospect, the economy was absorbing it pretty well. But it was energy prices + declining housing values that hit consumers, then businesses. It seems to me that Sumner's prescription was to keep the party going and give out easy credit to keep housing values up. Let's inflate our way to prosperity! One aspect of construction unemployment that is not discussed is the role of illegal immigrants. In the West and South during the housing boom, illegal aliens were employed in construction jobs in huge numbers. I suspect that their job loss isn't reflected in the government statistics. Why don't economists track the actual individuals in the population -- recalculation is a disaggregated story. Field studies tracking individuals are real science in biology. Economists seem too lazy to do real science. Worth mentioning is that parallel commercial real estate bust. Commercial values fell in half in the Great Recession. The commercial market is about one-thrid the size of the residential market. This again suggests that real estate busts were triggered by a decline in AD. The question is, why did the fed cut AD? To fight commodities inflation.